For many travelers of color, a strong community is as essential to travel as your passport or favorite worn-in luggage. Black American travelers specifically had to rely on a strong network while traveling, with our ancestors leafing through the handy Green Book while defiantly adventuring through the roads of Jim Crow-era America. 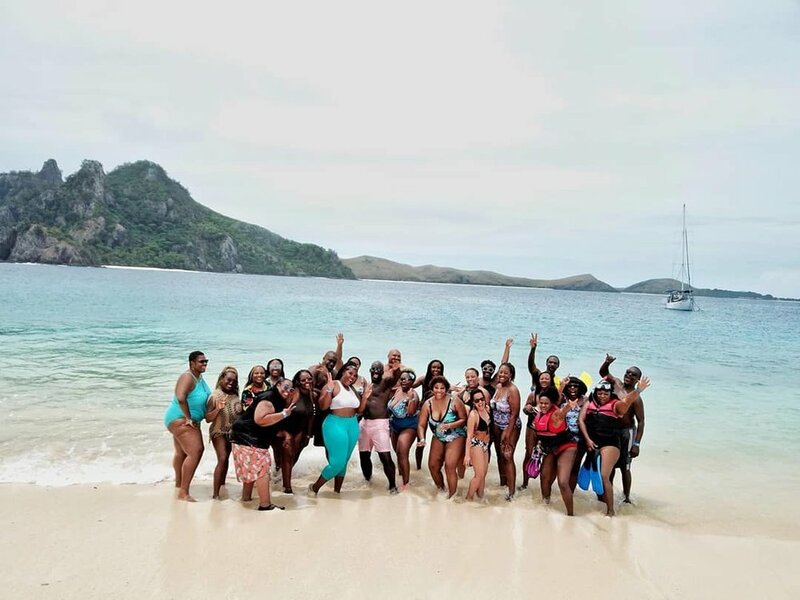 In today’s world, travelers of color like myself rely on social media communities, such as Nomadness Travel Tribe, a membership-based community on Facebook with over 19,000 members to date across the world. For me, Nomadness is my home away from home. In the several years I’ve been on the platform I’ve hosted countless of members, given and received free city tours and even helped honeymooners find a place to stay after a delayed flight that went awry. Nomadness Travel Tribe’s mission is simple: show the world that travel has no racial, gender, religious, economic, or interest limitations through community representation. Within Nomadness, say the name “Kenna Williams” and you’ll find people who’ve either met her, heard of her or want to be her. As one of Nomadness Travel Tribe’s most active members, you’ll find her sharing too-good-to-be-true-yet-it-is flight deals to seeing pictures of her having family dinners with locals in Fiji. Hey Kenna! First things first, please introduce yourself. I am Kenna Williams but fondly known as “Pusha Kee” to most people in the travel world. I am a 40+ Southern California-based aerospace engineer by degree working in the field of program management. I also own a small company with travel consulting as the focus. I am the creator of the trademarked term “#BookDatIsht” which means to book dat isht...book flights and plan it when you can. I'm an avid traveler and have visited six of the seven continents. You've travelled ALL over the world, from Fiji to Costa Rica. What did you think sparked your travel bug? I would have to say I was born this way! I am a Sagittarius and most people who fall under this sign are natural adventure-seekers. They yearn for knowledge and soaking up culture. For me, I could not deny this feeling (Sags can't sit still!!). I was inspired by my grandmother, Eudora Small, who lived her later years traveling all over the States. We used to joke that my grandmother (who lived in Mississippi) visited me more than anyone! I am also a descendant of Matthew Henson, the first black man to reach the North Pole. I have to think that this blood runs in me and keeps me motivated to go all over the world. Wow- that’s incredible! Especially learning about your connection to Matthew Henson. Where and when was your first trip to Asia? Do you have any memorable events of that trip? My first trip to Asia was about 10 years ago when I went to China with my mother. It was her first international trip. I remember my father made me promise to bring her back home...like come on Dad, I won't kidnap her! He paid for her ticket and all of her expenses and wished her well. The trip was extremely memorable because I had time to bond with my mom and I actually learned that my mom was pretty cool. I know that sounds corny, but my mom seemed a bit conservative. It was fun seeing her running the streets, going to the dance clubs, eating street food and blending in with the other travelers. You couldn't tell her that this trip wasn't her first! We used to joke that most people in the States start out with Canada or somewhere in the Caribbean, but she started with China. My most memorable trip to Asia was in 2014 to the United Arab Emirates. This trip probably changed my entire life because the flight was at that time one of the longest flights I have ever been on (Emirates LAX-DXB is at least 16 hours!). Initially, I booked a flight to South Africa but had to transit through Dubai. I decided to add a few days in Dubai so I could explore the local scene and get the opportunity to see the Grand Mosque in Abu Dhabi. Just a few of the Dubai BlackOut participants during the 2017 trip. I feel like we can't have this interview without acknowledging one of your most well-known projects, Dubai BlackOut. How did it start? Why specifically Dubai? Dubai BlackOut.... this started really as a fluke! In 2014 on my way back from South Africa, I stopped in Dubai and hung out with roughly 30 friends. On Christmas Day 2014, Etihad Airlines had the glitch fares with flights to Abu Dhabi from the states for about $175. Everyone I knew bought that ticket for Halloween 2015. In 2015, our group grew to roughly 80 people. Word spread fast, the following year 2016, the group was over 250 people. In 2017, our group was a strong 500 people! How in the world did this happen – thank you Facebook and social media! This October, I am headed back to Dubai for the 5th installment of Dubai BlackOut. It has really been a labor of love as Dubai tends to be a place many first time travelers feel is not attainable but it is and I enjoy facilitating this experience. As usual, I’ll be living vicariously through your travel pics on Facebook. But, seeing 500 beautiful brown and black people anywhere will turn heads – especially in Asia. What are the worst and best things about being a traveler of color in Asia? Worst things about being a traveler of color in Asia? Being Black. Best things about being a traveler in color in Asia? Being Black. I know... I answered this question with the same answers! As a traveler of color in Asia, you are what appears to be an anomaly, perhaps a real-life unicorn, in a place that is not sure what to make of your presence. I've traveled to several Asian countries, from India, China, Indonesia, and Malaysia, and my presence is always a curiosity. In some countries, the local citizens will call you famous Black people names like Oprah, Michelle Obama or Beyonce and I do not look like any of these women (plus my bank account does not reflect it YET!). In many places the people are so curious that they will take pictures of you (on the sly, but I know when you turn your camera in my direction what you are doing! ), pull on your arm and generally try to hand off their babies to you. I often tell myself that I am special, and if I had never seen anyone this beautiful, I too would stare! There are moments that are genuine and they are usually with families. One of the best moments of travel was in 2014 when I was at the Taj Mahal in Agra, India. An elderly woman and her husband approached me and they motioned for me to take a photo with them. It is one of the fondest moments ever. I often say my picture is probably in the homes of people all over India, China, Malaysia, Vietnam and other countries! What advice would you give people of color who are hesitant to travel to Asia? My advice is to #BookDatIsht! Do not be afraid that you do not speak the language, know the food or the culture. If you have an open mind, you can go anywhere plus flights to a lot of Asian cities are generally cheaper than buying a plane ticket to New York! So, what are you waiting for? I’ve definitely used “#BookDatIsht” several times in my life when I needed to have taken that leap. You might have heard of the phenomenon "Blaxit" where people of color are moving outside of the States for better opportunities. Do you see this happening in your community? Do you agree that there are better opportunities? Why or why not? I love this question. Most of my friends are expats or they are away so much that they might as well be expats. Opportunities overseas tend to be growing from what I can tell, with many of those opportunities are businesses that an individual can create. Many friends are educators overseas, some are working in the healthcare sector and others are in engineering or other STEM fields. I truly believe what pulls people overseas now is low overhead cost. If you're spending $3K+ a month in rent or a mortgage plus another $2K in other expenses, moving somewhere paying roughly 20%-25% or less is enticing. I should also state that some of my friends aren't working but they have made wise investments and are currently living off of the interests. Kenna living her best “Pusha Kee” life in Dubai. Many of your followers on social media know you through several hashtag campaigns (outside #BookDatIsht) where you lay out your life goals, from finding a partner to pursuing professional success. Your #YearOfYesManifest is so important for women of color – from having frank discussions on being financially secure (#GetThisMoney) to finding love. Is it easy for you to be so fully transparent online? Was there a journey for you to get there? Transparency is who I am. I am built to show my life – all of it, including the bad parts. I often tell people that being transparent is my therapy. It keeps me sane and on the right track. I've been like this my whole life. I think as a kid my parents would always tell me to hush... teachers said I talked too much and my conduct was always unsatisfactory! Ha! They just didn't understand that my life of being transparent helps me, but it is also something to help other people. I have said a lot of things in public spaces that are often difficult topics, but my joy is when someone calls, texts, inboxes or contacts me somehow to let me know that my words have made a difference. That is what I live for. Kenna (far left) and a few travel friends enjoying the white sands of Fiji. What are three packing/traveling essentials you recommend for travelers of color who want to travel to Asia? Ohhhh another great question. Three packing/traveling essentials: Download the shared ride app in the country you are going (this is probably Grab, Uber or Careem depending on where you are going), wear compression socks on your flight to prevent DVT, and pack sunscreen because the sun is brutal! Kenna, it’s always been a pleasure connecting with you! Where can our readers find you?